The one question that everyone wants an answer to is what happens after we die. Many of us also wonder if mediums really do talk to dead people. The only way to find that out is go to a medium or two and find out for yourself, which is what I have done. I have learned for myself that the answer is yes, there are people who talk to dead people. If mediums are not talking to dead people, then there has to be another way they receive the information and that leads to a lot more questions. During a family vacation to our nation's capitol in 2005 I naturally took nearly about 100 photos. Not surprisingly I did capture a few orbs! The first were in the Capitol Building in a room that was originally where the Supreme Court met. We were taken on a tour by one of our Senator's interns. The next one was the ceiling in the capitol building and the orb is to the right, center. We also went to Colonial Williamsburg where we attended a one man play about Thomas Jefferson. Looks like a few spirits went also! Labels: capitol building, orbs, paranormal, spirit, spirituality, Washington D.C.
Today I went to a Spirit Fair in Tulsa, Oklahoma and met with an intuitive artist, Lauren Kelley. The first thing she said to me was that she saw a "pretty pink glow" around me. 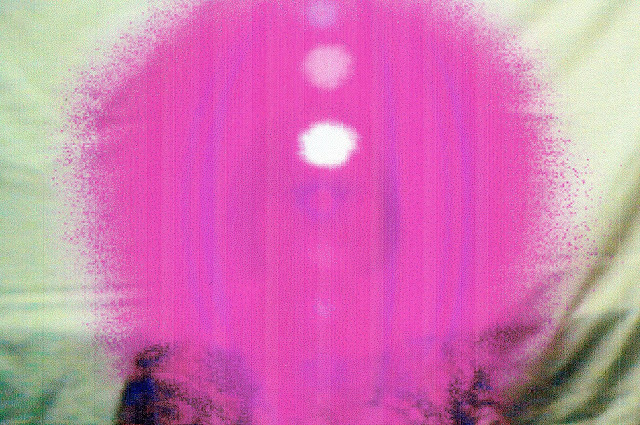 (Later I had an aura photograph taken and imagine my surprise when it came out pink!!) She saw that my crown charka was purple (or violet) which is what it was on my last aura photo. My third eye and throat were blue and my third eye is opening up, as is my heart, to spirit. The bottom line I am told, is that I am becoming more open to spirit and intuition. But more interesting to me was when she saw a large dog or wolf by my left side who was helping to guide me. I have lost two boxers in the past so it is nice to think that it could be one of them. Then on my right side she felt a female presence that she thought was a grandmother or great grandmother who was almost masculine in her attitude, but on the other hand was very creative. She drew her in orange for creativity. One of my grandmothers was indeed an artist and talented seamstress so that is who I believe it to be. As for being masculine, I don't know since she died when I was an infant. However, her nickname was Johnny. Don't ask me why. Also on my left side is a white dove which also has something to do with spirit and guidance. I did enjoy the experience and plan on seeing her again at other spirit fairs. It would be interesting to see what changes there will be in a few months. 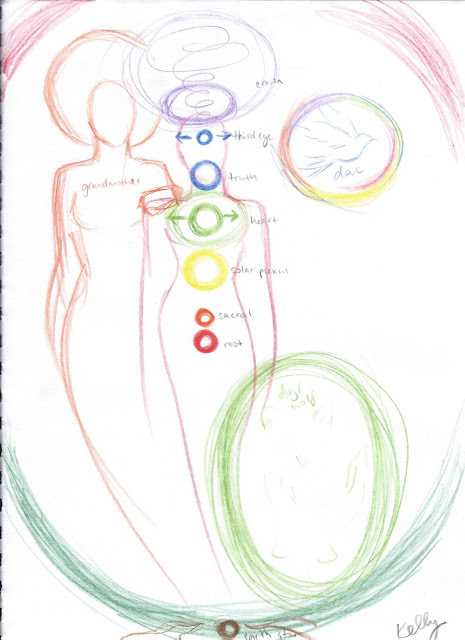 I have included the picture that Lauren drew and my aura photograph that has my charkas on it as well. This photograph was taken by a different vendor with a different camera than what had been used previously. A few months later I had my aura photographed again by Aura Star who took my first two photos. It was my third photo taken by them and it was similar in color to the first two. So what I can conclude from this experience is that it is best to stay with a vendor who uses the same camera that was used in previous photos. Unfortunately I didn't think to get and the name and manufacturer of the two cameras. Made a note to myself to do that next time I get an aura picture taken!